Blueberry plants not only produce tasty crops of blueberries the second season after planting, blueberry plants add a natural beauty to the landscape as well. Growing blueberries in Florida requires selecting special low-chill cultivars that grow well in the state's warmer climate. Choose southern highbush cultivars, if you live in Central Florida between Ocala and Sebring. Grow rabbiteye cultivars, if you plan to grow blueberry plants in Ocala or other northern areas of Florida. 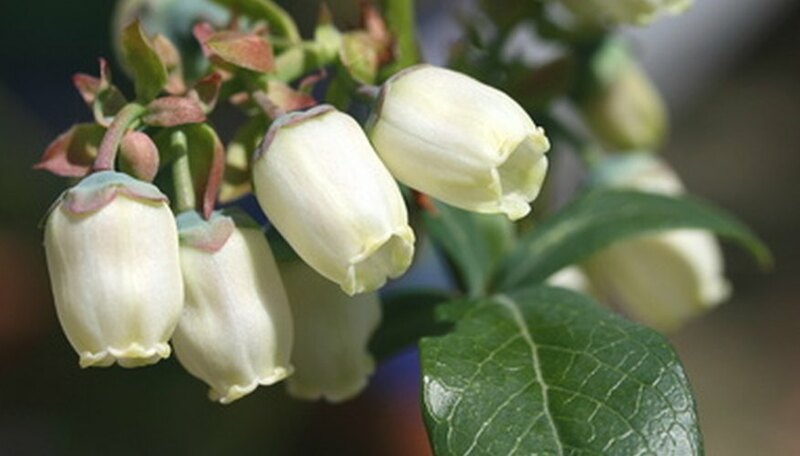 Grow at least two or more cultivars of blueberries to ensure pollination of the plants. Select the site to the grow blueberries that provides full sun and well draining soil. Pick a location clear of any tree roots (except pine trees) and no closer than 20 feet from structures. Plan to plant the blueberry plants in Florida some time between the middle of December to the middle of February. Clear the area for planting blueberries of all plants and debris several months before the intended planting date. Add peat moss to the soil and mix it to a depth of 6 inches. Water the potted blueberry plants before planting. Dig holes big enough to place the blueberry plants at the same height as they grew in the nursery. Allow extra room for adding more peat moss to the bottom of each planting hole. Space the southern highbush blueberries 3 feet apart and rabbiteye blueberries 5 feet apart in rows. Remove the plants from their containers and loosen the roots. Place the blueberry plants in the holes, spreading the roots out. Fill each hole with the removed soil halfway full and water thoroughly. This will remove any air pockets in the soil and compact the soil around the roots. Finish filling the holes and water again. Add a 3-inch layer of mulch around each transplanted blueberry plant. Keep the mulch away from the stem of the blueberries and expand it 2 feet out from the plant. The mulch will prevent any weeds from growing in the area and retain moist soil levels. Prune the newly planted blueberry plants leaving the largest middle cane untouched. Cut away any frail branches found at the bottom of the plant. Get rid of any blossoms before fruiting takes place for the first season. This permits better overall plant development.